I took this photo when I was in lower Manhattan in the beginning of last summer 2015. We were visiting the Wall Street area. 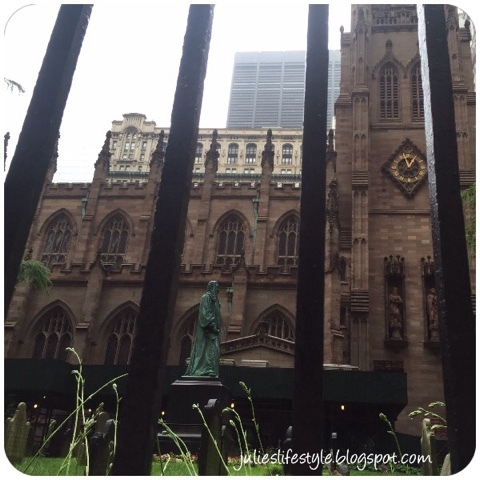 I captured this shot of Trinity Church in New York City. To read more about Trinity Church you can click HERE. The day that we went to visit this area, it was a cloudy and rainy day. This is a wonderful area of New York City to visit, sightsee, and explore. I do hope that you have the chance to visit it someday. I'm not sure I've ever seen that church on all of my visits to NYC. I definitely have to make a point to go see it the next time I'm in the area! One day I will make it to NYC. Your photographs have inspired me. I love old churches - so pretty! It's very majestic Julie! I love visiting churches. Love how you took the photo thru the gates! So pretty! I think this is the church I saw this church when I was in NYC several years ago. The name is familiar. Hope you're having a great week. Hugs to you my friend! Wow, could've sworn I was here... oh well... that's right I was and I was reading your post and then got up to make supper. Love the picture of the Trinity church. If I ever get to New York this will definitely be on my list. Thanks for sharing and thanks for stopping by. Oh & following you on now won't you stop by and follow me too on my Linky Followers? Thanks. Beautiful and inspiring photo, dear Julie. Have a glorious day! Hugs! Look at that architecture!! Such detail - just beautiful. I would love to visit NYC again someday!